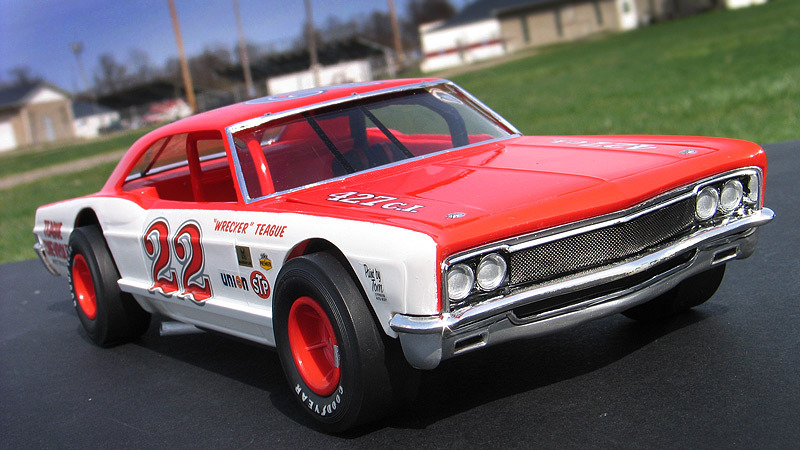 When all the old vintage AMT modified short track race car kits were recently re-issued by Model King, I was very happy. These kits haven't been on the market since I was a little kid in the early '70's and prices on original un built kits had sky rocketed since then. So, I was excited to finally get a change to collect them all and build them at reasonable prices. 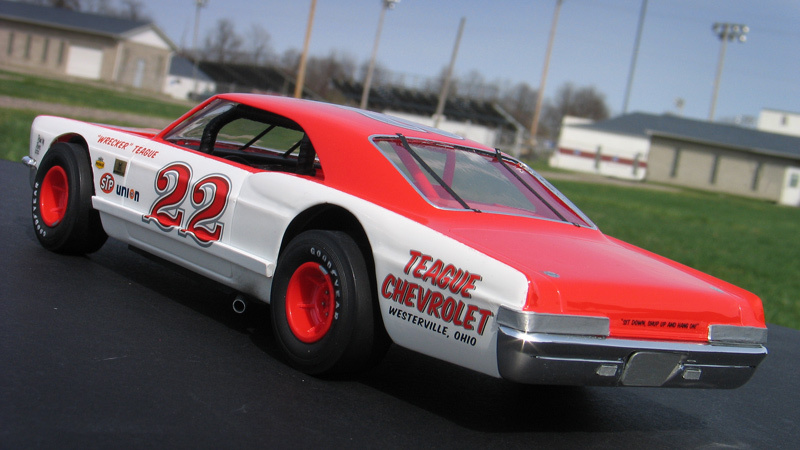 The first one I built is this 1966 Chevy Impala late modified stock car kit that was part of a series of AMT kits called "Modified Stockers". 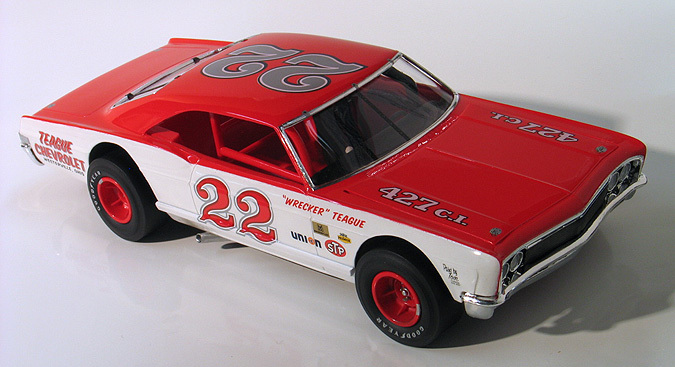 Along with this '66 Impala, the series also included a '64 Galaxie, '65 GTO, '65 Chevelle, '66 Skylark, and a '69 Falcon. I believe they were all fictional race cars and represent the type of modified stock cars that raced on both dirt and pavement short track ovals during the '60's and '70's. They are pretty simple kits but capture the look of the era. 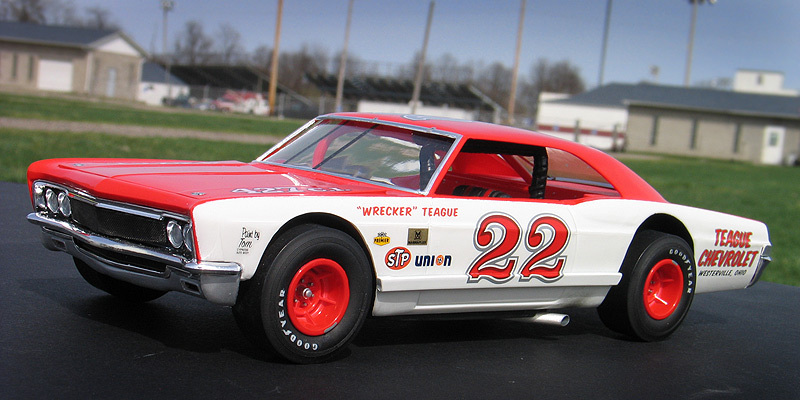 The really sad part though is that AMT hacked up the tooling of the stock versions of these kits in order to make these race cars, so they can no longer be re-issued as the stock versions. Although this Impala kit is intended to be a dirt track car and includes extra tube bumpers and a front push bar I decided to make mine an asphalt car. Asphalt cars usually ran a smaller diameter tire and had less protective body bracing. To build my version of the Impala, the first big change was to ditch the huge dirt tires that come in the kit and find ones more suitable for asphalt. I dug through my parts box and finally settled on using 2 sets of the rear drag slicks supplied in the Model King '63 AWB Tempest. To fit the tires I dremeled open the front fenders a bit more and ground down the back side of the wheel openings so the thickness would look more realistic. 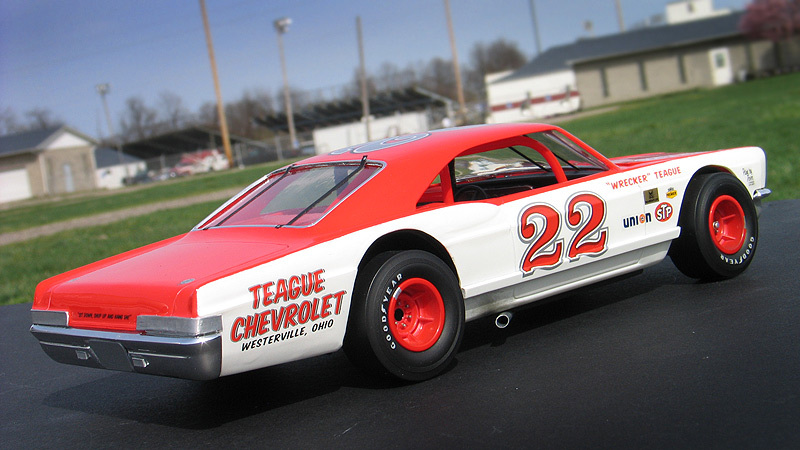 I also added styrene strips to both sides of the Impala's body to represent the steel crash beams that were often added to these types of short track race cars. To the rear I also simulated aluminum covers over the Impala's tail lights, back up lights and rear license plate made from styrene sheet. Oddly, the kit does not include a rear window. Here's a couple of modeling tips for you. I fabricated a rear window from a clear plastic package that an electric razor I bought came in. Over the years I've saved a few old clear plastic packages around just for this purpose because they often have molded shapes that can be easily cut for model car windows. After the window was mounted I finished it off with some window retaining straps made from ChartPak black tape. Other details I added include a new front grill screen made from real wire mesh and exhaust pipes made from aluminum tubing. The final touch was dry brushing a little oil pastel chalk over the exhaust exit for extra realism. I tried to give my Impala a look typical of an early '70's short track car that might have ran on a limited budget sponsored by a local Chevy dealer. For the paint scheme I based my fictional design based on the decals I had designed for the Model King '75 Laguna kit. When I designed those decals I had these Modified Stockers in the back of my mind so I secretly added extra artwork and scaled a lot of it to fit on these kits. 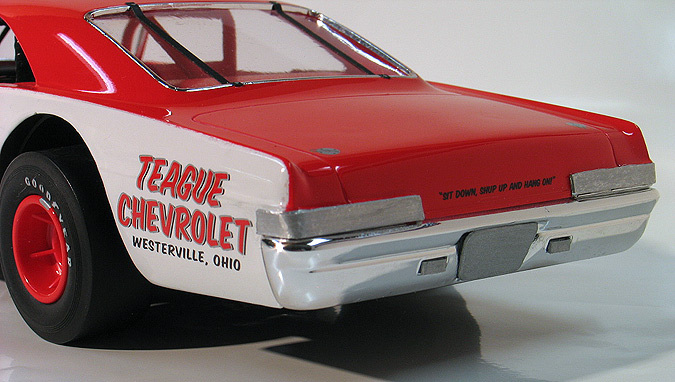 The Impala's paint job consists of Tamiya gloss red over Tamiya gloss white sprayed from the cans. Pretty simple stuff. I really like Tamiya's paints because they go down smooth and dry quick. After the paint was dried I cut apart two different Laguna decal sheets and repositioned the art in order to place the #22's and the fictional Teague Chevorlet sponsorship on this car as shown. I also added the engine displacement markings on the hood and the slogan on the trunk from the MK '69 Camaro Funny car decals I designed. The vintage fender stickers came from a Yesterday's vintage sponsor decal sheet.